The West Point Lighthouse Inn is among the most recognizable places on Prince Edwards Island. The Inn was originally created in 1987 by the West Point Development Corporation. In 2009 and after 20+ years in operation the WPDC undertook a project to redevelop their facilities and surrounding area in order to make West Point a leader in the Tourism industry in PEI. This redevelopment concluded with the expansion and complete renovations to the West Point Lighthouse Inn, the upgrading of the West Point Lighthouse Museum, the relocation of the restaurant to a newly created facility on the West Point Harbour and the integration of the facilities with uniform signage, a new boardwalk and a streetscape project. 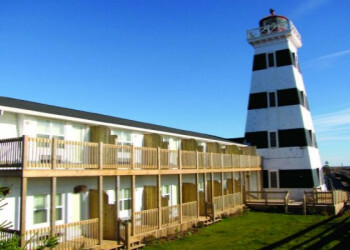 The West Point Lighthouse Inn is a recently renovated facility located along the North Cape Coastal Drive in West Point, Prince Edward Island. The Inn features 13 rooms that will be sure to appease all guests. All rooms have breathtaking views of the Northumberland Strait and 11 rooms have walk-out decks. Two rooms (The Keeper's Quarters and The Tower Room) are located in the historic West Point Lighthouse Museum.